My mouth hung open stupidly. I looked at her, at her big eyes that held my gaze steadily, at the flat line of her lips, and perhaps inescapably, at her black hijab, flowing along each curve of her head. With a hopefully imperceptible stammer, I told her I had always been interested in learning more about Islam and all religions generally. “That’s cool.” She gave a small nod of her head and smiled slightly, before turning back to her food. I passed the test!!! My proud satisfaction comes only in retrospect, though; I was too breathlessly relieved for exclamation marks. Indeed, Bazilah’s question felt inevitable and her serious tone was both reasonable and not wholly surprising. As I looked around the Ngee Ann Kongsi Auditorium, I felt much more surprised to find that I was one of probably no more than five non-Muslims in the room. When I saw the posters stuck up around Cinnamon College for the Islam Awareness Series talks, I imagined at least a big group of fellow USP students turning up, with a restless but quiet curiosity. 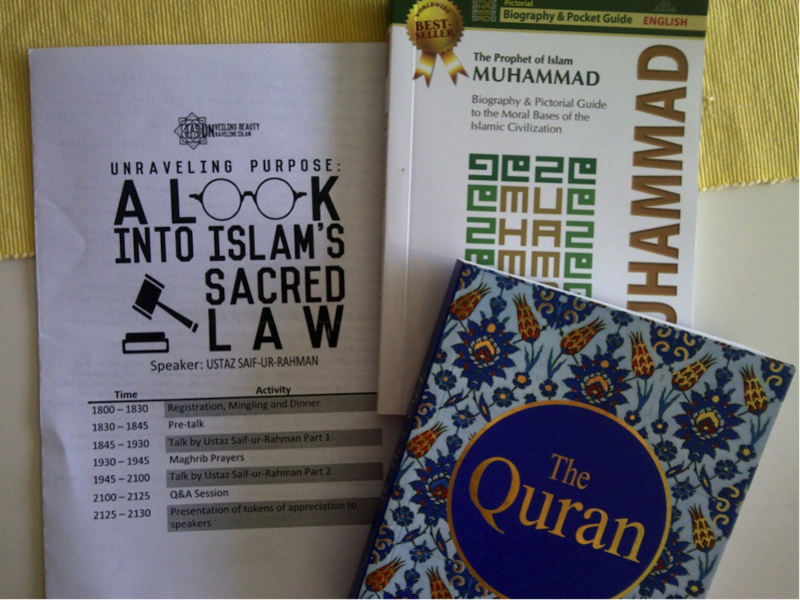 Why would anyone miss this free and convenient opportunity to learn about this largely misunderstood and complex faith, especially with this no-nonsense title, “A LOOK INTO ISLAM’S SACRED LAW”, enticing them? The free dinner and handmade desserts are worth at least a hundred bonus points, surely? It was 10th February, a Tuesday evening, and I was feeling tired, but as the talk began to start, I gathered my strength up to be enriched, and boy, was I! The speaker, Mr Ustaz Saif-ur-Rahman, is an eloquent International Fulbright Scholar who formerly managed the Sharia Court of Singapore, which I never knew existed before that day. He opened with the broad question, “What is Sharia law?” That phrase sounds misleading now, for I learned that most Muslims don’t see Sharia law in such a strict, restraining sense as the word implies, but as an empowering way of life that lies deep within themselves. Above all, the goals of preserving and enriching life govern other judgements and actions. I can go on for a long time about what I learned concerning Sharia law, but the notes I took do not cover the uplifting warmth I felt in the auditorium that day. For it was not merely an intellectually engaging experience, but an emotional and even spiritual experience where I more than once wondered at my extraordinary position in this friendly community like a lucky person stumbling into a little known but obviously very hip and exclusive place in town. And, as this person would shamefacedly whisper to the man beside him, “What is this place? Why have I never heard of this great place?”, I also blush to say how I amazed I am by the Muslims’ curious and inclusive passion towards their faith. It will do them a disservice to say ‘in spite of’, because I believe it is truly because of today’s diverse interpretations of Islam, among non-Muslims as well as Muslims, that many Muslims seek to learn more about their own faith and raise awareness of it to others. Neither is their passion fired up with a vengeful injustice; they have a drive to enrich their own understanding of Islam and they proudly share their deeply cherished beliefs with everyone, as many of other faiths also tirelessly seek to do. I’m most significantly inspired by how they practice and share about their faith with so much pleasure: the speaker was extremely friendly and constantly joked with us, laughing frequently about some stereotypical perceptions of Muslims. Indeed, we should pursue knowledge and practice faith seriously, but we should never forget to make it fun. I had such a meaningful experience exploring the Islam Awareness Week; I hope the NUS community continues to support this and more similar programs. It’s so humbling, pushing ourselves to find out more about what we see so often but admittedly understand little about, and we discover something beautiful not only in others but also in ourselves as a part of this world. Next Entry MC Elections’ QnA : TLDR.